The MacCast » Blog Archive » Line already forming for iPad 2? Line already forming for iPad 2? It’s over 4 days before Apple will begin selling the iPad 2 (sales start at 5:00 PM PST this Friday). Apparently hasn’t stopped someone (see picture above) form getting in line early, real early. 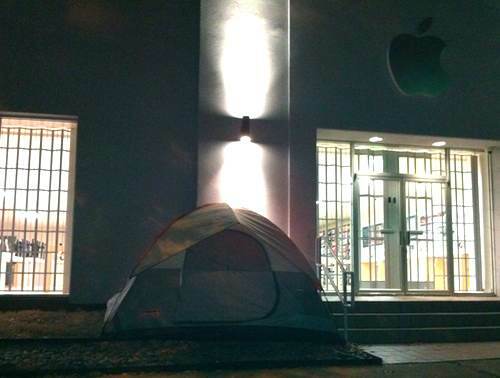 Maccast listener David sent me this snapshot of a tent apparently already outside a temporary Apple Store location in Texas. The Knox Street Apple store is closed for renovations, so they have set-up shop around the corner on McKinney, Avenue. We don’t know for sure yet, but it’s a good guess that guy inside the tent is famous Apple line sitter Justin Wagoner. Justin if you remember got a lot of press for being first in line for the iPhone 4 days before it went on sale. There have been rumors that initial shipments of iPad 2’s might be lower than Apple had wanted due to supply constraints, but I doubt you’d need to line up now to get one. My guess is Justin just really likes the attention and we’re happy to give him some. Somewhere, a village is missing him. With the iPad 2 coming out in so many places on launch day..waiting in line 4 days in advance is about as useful as mud flaps on a turtle. Justin, and the Knox Street Apple Store, are in Dallas. For anyone that was unaware that: there is more than one city, and Apple Store, in Texas. Justin go for it… I was the first to recieve the original iPhone in Portland Oregon! I waited in line overnight buy myself till 5 am when some of the other iPhone freaks finally arrived for us to wait all day at the Pioneer Square Mall. When I got dropped off the night before about 9 pm I smiled to myself thinking I’d be the first to get this super device of the 21st century. Hey does that tent have a bathroom and shower? I tried to pre-register at my iPad store here and got the same news… No pre-registering: ‘We don’t even know what the price is going to be,’ we were told. I really think the eBay etc. onslaught of used iPads reflects a large interest in moving up… while most people, like me, plan to just hand theirs over to a lustful family member. The lesson was already learned with the iPhone 3G — how many people regretted that move to better functionality? In the case of the iPhone 4, my sales contract discouraged a similar quick move, but there is nothing like that with the iPad, even the 3G, with its non-contractural aspect. We have to wait a bit longer in Japan (a week after my St. Pat’s birthday) but to me the anticipation is a large part of the pleasure. To be clear, no one has confirmed that the person in the tent is indeed Justin Wagoner. That was just best guess speculation on mine and David’s part. So you stood outside his tent and took pictures, but you didn’t have the guts to go ring his doorbell and ask his story? Sounds like scaredy-cat journalism to me. For all waiting to get your iPad 2 jailbreaked, I has already done that and expect it to be out soon for everyone,haha. The engineers at Apple HQ in Cupertino could not have done a better job on that alarm but for once I was wishing theyd screwed it up since I think it should be a crime for an alarm clock to ring before 5 00 am.I dragged myself out of bed got ready to seize the day and hurried to the local Apple store located outside of Houston in Friendswood Texas at the Baybrook Mall. Completely out of sight and might have stretched to the moon from what I could see.By the time the Apple store opened at 7 00 am both lines were significantly long so long that I could not see the end of either one. Prior to opening store personnel worked the line to confirm our reservations checked our IDs and checked us in. It was a good possibility that a lot of walk-ins were going to be turned away before the end of the day.Apple was a good host and provided snacks and drinks.